This short tutorial provides instruction on how to control Mini-Circuits’ RCDAT-series programmable attenuators via Ethernet using HTTP and Telnet communication protocols. 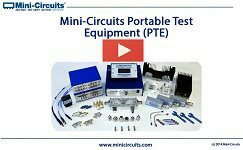 Abstract: Mini-Circuits has developed an innovative line of test equipment that can improve test efficiency and provide reliable test results without a big investment in complex laboratory equipment. 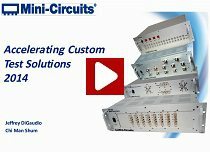 These products range from small Portable Test Equipment (PTE) including signal generators, switch matrices, programmable attenuators, and smart power sensors to custom integrated rack-mount test solutions. 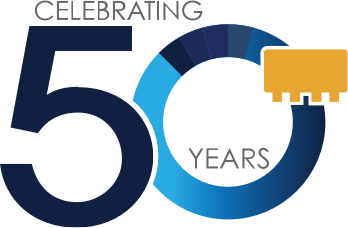 Most recently, Mini-Circuits has accelerated custom test solutions with modular test rack designs resulting in turnaround times as fast as 1 week and greatly simplifying system maintenance. All modules include user-friendly GUI software and DLLs for almost any programming environment that supports ActiveX or .Net frameworks, allowing the user to develop customized control applications. 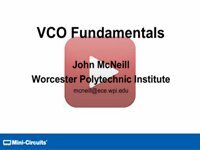 Abstract:This webinar will cover the fundamentals of voltage controlled oscillators from functional block concept to input-output relationships, basic performance metrics, types of VCOs, methods of tuning, second order performance metrics, and comparison of VCOs. 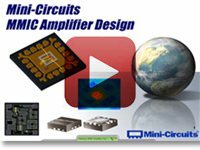 Abstract: This webinar offers an insight into MMIC amplifier design approaches, from semiconductor technology selection, circuit architectures, characterization and testing to final market released MMIC amplifiers. 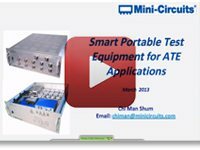 Along the way, some key differences in the approach between Mini-Circuits and typical market products will be highlighted.